A French Renaissance | about the book and life in France! Well done on writing and getting the book out. Was it a labour of love or a more tricky proposition along with kids, work, and house refurbishments. It was a labour of love in that I always wanted to have a go at writing a book but it was also a tricky proposition in lots of ways. I really enjoyed the writing process. I’m happy to be alone with my thoughts and I enjoyed the challenge of trying to get a story into print, but finding the time to write was a major challenge. I was still working full-time, we also had to contend with the maintenance of a large property and property renovations, and we had two young children, so I didn’t have a lot of spare time. Anyone who has read A French Renaissance? will be aware that in early 2014 we were involved in the setting up a community café in the village where we live here in France. Well, I’m delighted to report that so far this little venture has been a roaring success. The reaction locally has been amazing and everyone has really got behind it. Lots of people have told me of how they had been waiting for something like this for many years. In a village where there are no shops, bars, restaurants or other services, there is a real appreciation of this, albeit modest, effort to bring some life back into the heart of the village. For the moment the café, called La Gariotte, is open on the first and third Friday of each month (run exclusively by volunteers). 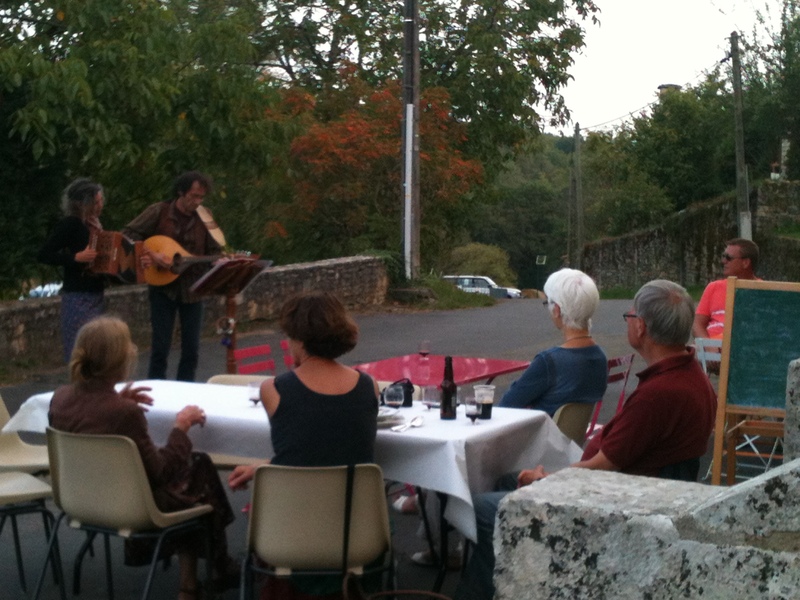 During our most recent opening (Sept 5th), two local residents, Jérôme and Estelle, came long to play some music. La Gariotte abu! A question people often ask me when they hear we moved to the south of France is: are you glad you moved, and did it work out as you expected? My answer is basically yes, we’re glad we moved, but no, it didn’t work out anything like we expected. In fact, in many ways it has been the polar opposite. Looking back now I think our expectations were too high. We had a romantic vision of how our new life would be, which was a great motivator, but the reality is very different. I’m not saying it’s all bad, just different. The catalyst for out move was the birth of our children, Ned and Astrid. 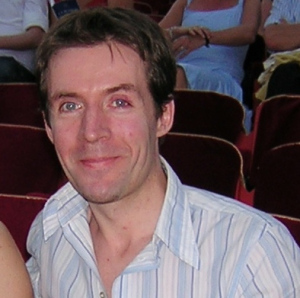 My wife Tanya and I were living in Brussels at the time, having moved there from Dublin in 2001. When you have kids everything changes. You start to reassess things and you find yourself moving into a new phase of your life where your needs and outlook are different. We had often dreamed about moving to France but it never really felt like the right time until the kids came along. Then it almost seemed like the obvious thing to do. We wanted them to grow up somewhere they could feel part of a community, which wasn’t possible in Brussels. But we also wanted to have time to spend with them, and to pursue some of our own interests; things that had gone on the long finger for far too long. At the time, we also thought about going back to Ireland but it just didn’t seem like the right thing for us. We love Ireland. Tanya and I both come from Bagenalstown in Co Carlow and in many ways we still consider Ireland to be our true home, but France had that romantic allure, the promise of the idyllic lifestyle that we often dreamt about. We had to give it a go. And so in early 2010, we took a deep intake of breath, resigned from our jobs, sold our house and set off to start a new life in the Lot valley, an incredibly beautiful, but also very rural and sparsely populated part of south west France. It was a risk, but one we had to take. If we hadn’t, we knew it would be something we’d regret for the rest of our lives. Interestingly, from the moment we announced our intention to move to France I could sense there was a real curiosity among our families and friends. I think many people just empathised with our situation. The kind of society we have created and that exists in most big towns and cities today is hard on people, and especially hard on families. It can become a treadmill of earning and spending, leaving many people feeling detached, stressed and unfulfilled. This is one of the main reasons we moved and also why I decided to write a book. We were trying to get away from all of this and it seemed like it might be worthwhile to try and document our experience for the benefit of others. The book goes behind the scenes to tell the story of our move and our first two years in France, including: our struggle to find and acquire the property of our dreams; raising the finance we needed and our ongoing financial concerns; adjusting to life in a strange land and our stand-off with a local French farmer; integrating into a new community; the joys and challenges of living in the countryside, including some strange wildlife encounters; property renovation nightmares; launching a gîtes and chambres d’hôtes (B&B) business; the strains of the move on our relationship; and the valuable life experience and lessons we learned along the way. It has been a real roller coaster. Every day threw up new surprises, which made it exciting but also quite challenging at times. Making a new life in France took longer than expected, it was more difficult than expected and the reality is completely different to how we had envisioned it. But we have grown and matured and learned to be happy with what we have. When I listen now to the kids speaking French, when I see Ned O’Hara lining out with the local football team or Astrid O’Hara singing (in French) with her class in the village school, or Tanya serving in the local community café we helped to establish, I realise just how far we’ve come in a few years. Would I do it again? Yes. Would I do it again if I knew what I know now? Yes, but differently.